In my experience, many new home buyers (especially 1st time homebuyers) underestimate the costs for renovations (i.e. their eyes are bigger than their wallet) and underestimate the time frame needed to get the work done. At the same time, closings often get delayed, so if they don't plan ahead, their timeline can get scrunched. There are some projects that must be done before you move in (e.g. sanding and refinish the floor or adding site finished hardwood flooring), while there are other projects that many would prefer to do before they move in (e.g. painting, carpeting). And, there are some projects that can take a long time and may require some saving up (e.g. kitchen remodel, bathroom remodel). 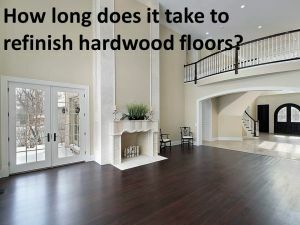 New home buyers (and their realtors) will find this article helpful about the length of time it takes to sand and refinish hardwood floors. It's usually longer than most realize and they don't always factor in the extra 4 days they need at the end before moving in the furniture. The second common mistake I see is homeowners doing thing in the wrong order. These 2 articles should help. New home buyers and realtors may also find this helpful: 3 tips for new home buyers looking to renovate. It will help them avoid some of the most common pitfalls. I hope this info is helpful. If you or your clients live in the Westchester NY/Fairfield CT area, feel free to give The Flooring Girl a call 914-937-2950. Sure Debbie, especially if sanding of floors needs to be done, it's so much better before move-in date. Yes, it is so much easier (and less expensive) to do before moving into your new home. Debbie, I love the comment, "their eyes are bigger than their wallet". I have often experience this with first timers too. Jerry - Yes, it happens all the time. Often, they can only do floors and painting before they move in. Kitchens and bathrooms often need to wait. They not only under estimate the expense, but also the time involved, the inconvenience and they are ignorant of all the choices available. Debbie - Yes, all good points.